Many people refer excellent opal stone, striking the eye with its unusual beauty, to the most beautiful of all known gems. A distinctive feature of opal is characteristic play of light, called opalescence. This effect is that from the depths of the stone milk and pearl reflections appear due to the content of the special microscopic inclusions. Magical reflections allow this stone to acquire, except the core, and a number of additional colors. Bright fiery, mysterious green, colorful black, pale blue and soft pink gem is simply beyond description. Thanks to the rich colors and incredibly beautiful warm glow of a variety of shades, this stone is deservedly gained the status of particularly valuable, even among the jewels. Scientists have found that opal is a petrified wood or ksiloid. Many call it a volcanic stone, as it formed of siliceous helium in the cavities of lava after the eruption of volcanoes. It is assumed that opal is formed by temperature lowering of the helium to hundreds of degrees. In addition, opal is formed in soil and even in plants. Until recently, mines in Czechoslovakia were considered the oldest stone deposits. Previously, these mines belonged to Hungary, so opals mined in that area, called Hungarian. But in the nineteenth century there were rich deposits of opals in New South Wales in USA. These mines appear good competition by their age to Czechoslovak ones. White opal color mines were found in South Australia. In general, Australia is the richest provider of opals in the world market of precious stones. Almost 90% of production belongs to this country. Opal, having beautiful fire shade, is mined in Australia. There are also mined blue and pink gems here. USA also contains many areas of production as the most diverse in color and quality opals. This precious mineral has many varieties, but they are all divided into two big groups: common and noble. Prozopal having apple green color is referred to the ordinary category. It also includes banded opal-agate and opal-onyx, yellow-brown mineral with a waxy sheen, porous muddy gidrofan, porcelaneous cacholong. Ordinary group includes and similar to glass splinters stone hyalite, reddish-brown opal jasper and very rare pink mineral that look like moonstone because of its bluish glow. Precious stones group is not less diverse. Here the most famous “cat’s eye”, royal opal, lehos-opal, girasole, cherry, fire gems and many others. Talking about their beauty and strong magical properties is discussed below. White opal is very light, it has opalescence of light blue tones. This stone is the most available species among its other “brothers”. Milk white color gives the stone a certain mystique, that’s why probably this color opal is very popular. A variation of this species, having black color, includes not only stones of mentioned shade. These include minerals grayish-black, dark blue, dark green, dark gray colors with multicolored shades. “Harlequin” should be distinguished among opals with fiery background. This species differs by beautiful variegated colors, highlighted with fiery reflections. Heavenly blue stone came from the Australian deposits. It is very much appreciated and is often found in jewelry. White, dark blue and orange-red gems are the most commonly used in jewelry manufacture. Also jewelries are often decorated with opals having pink, black and blue colors – these gems are the most famous and at the same time incredibly beautiful. One of the most popular is fiery mineral, simply captivates with its fiery brilliance. However, all stones are attractive in their own way and, of course, universal. Beautiful gem opal is composed of water and silicon dioxide. The amount of water in the mineral may be from 0.4 to 30%. And properties and quality of opal depend on the volume of water in it. Optimum amount of water is less than 10% for precious stones. The more water in the stone, the more it is transparent. When fully dry stone is cracked and can even disintegrate completely. Opal belongs to the soft rocks so is easy to split. It is soluble in hydrofluoric acid. mineral may even swell because of excessive moisture. Opal has the property of changing its color. This property can be observed by lowering the mineral into dirty water or dye: opal will get a completely different color. For example, blue opal lowered into dirty liquid can become orange or brown. This stone is capricious. It can’t stand heating. This is a sign that when it is used by jewelers who need to comply with all the rules and create the optimal conditions for gem. Owners of the stone must also consider its properties and treat it very carefully to keep intact. Opal has not only special physical and chemical properties, but also magical. They are described below. Magicians of almost all countries in the world recommended it as a mascot against the evil eye, witchcraft and failures in life. People have long known the magical properties of opal. In eastern countries opal perceived as a magical sign of love and family happiness. Opal is itself a very strong mineral. It protects its owner from epidemics, fires, thefts or even evil. Sages don’t recommend to wear jewelry made of opal having black shade to spineless people. It is believed that they will be subject to doubtful vicious pleasures. 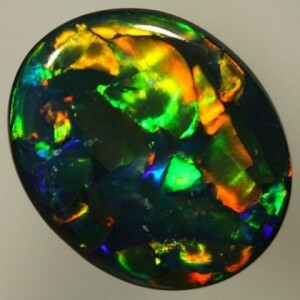 Black opal stone can enhance fear of the dark. However, opals of such a color allow magicians to increase their magical abilities. These properties are enhanced by edging stones in gold. White opal shade will help to strengthen the spiritual principle, give peace and tranquility. Talented people wearing opal can feel development of their abilities due to this stone. According to astrologers about what zodiac sign can wear opal and whom it is not recommended is similar. Those whose sign is Libra, Aquarius, Sagittarius or Taurus, can wear opal fearlessly. Also if your sign is Pisces or Cancer you can buy an amulet of opal and feel its beneficial effects. Black opal has the strongest power. It is ideal for Scorpio, reinforcing its inherent activity and tremendous energy. The stone is not contraindicated and for air signs. However, no fire sign is able to wear opal, and especially Aries. Only Sagittarius can afford it and that choice is limited – the sign can acquire only a fiery stone that will make these people stronger. Firestone itself improves performance and enhances energy. Fickle, with fragile and weak nervous system people should beware of this mineral. But altruists, distinguished by their nobility, can acquire opal talisman without fear. East horoscope also restricts who can purchase for himself this amazing gem. And it recommends opal gem to those who are born in the year of black Cat and white Boar. Blue mineral is considered to be universal. It is suitable for almost all people. The same applies to opal, having pink color. However, pink opal does not fit a water Snake and fire Tiger. Thus, no matter what your sign is, you can buy precious opal mineral of a certain color and even help enhance or suppress some character traits or develop greater innate inclinations and even magical abilities.